For the last few weeks I have been aware that my carbs were a bit out of tune, and as it was a beautiful day on Saturday I spent a happy hour cleaning them. I took photographs all the way through so I could share my approach. 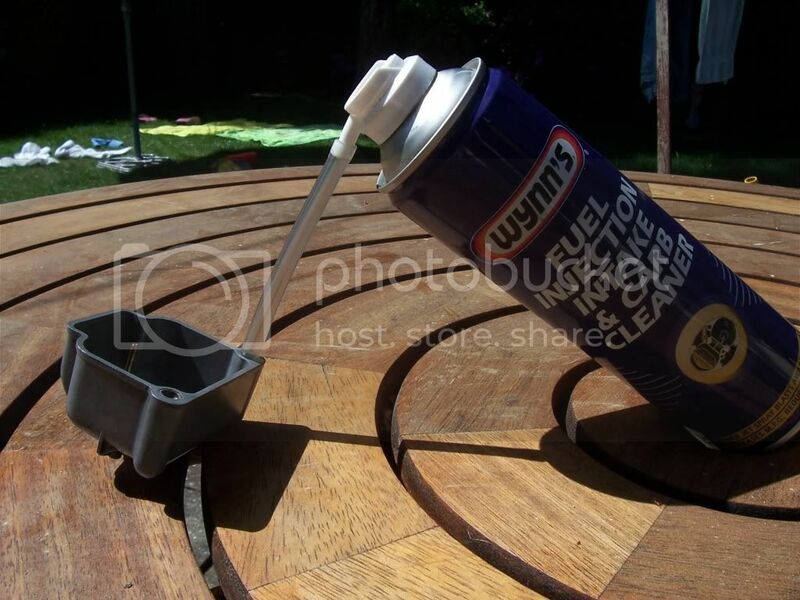 I don't have any access to compressed air, so I use aerosol cans of carb cleaner and air. You will also need a 6 inch length of car window washer pipe, a 10mm flat spanner, a screwdriver with a flat blade and clean rag. First off remove one carb. My approach is to drain the float bowl; remove the air pipes, let the carb hang on the cables, remove the cables trying to keep the tightening nut stationary on the threaded end of the cable, remove the fuel pipe. 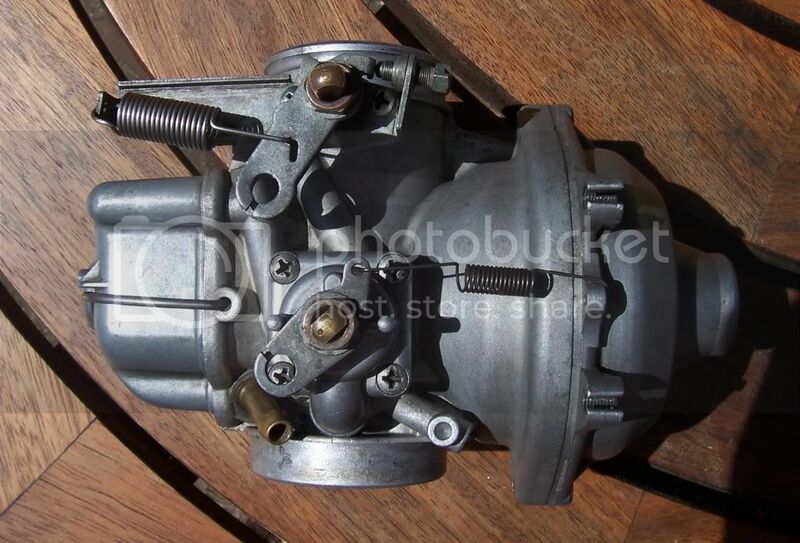 This is the right hand 40mm Bing carb from my 1989 R100GS. I then remove the float bowl and look for debris. I clean inside the float bowl and check that the brass vent pipe is not blocked. It is very easy to get blockages in the tiny jet in the tube in the corner of the float bowl. I blow this through with carb cleaner using the 6 inch length of pipe. Then remove the main jet assembly using the 10mm spanner. I dont normally remove the main jet from the jet holder. Just check that the main jet is clear and that the o ring has no splits and isn't perished. 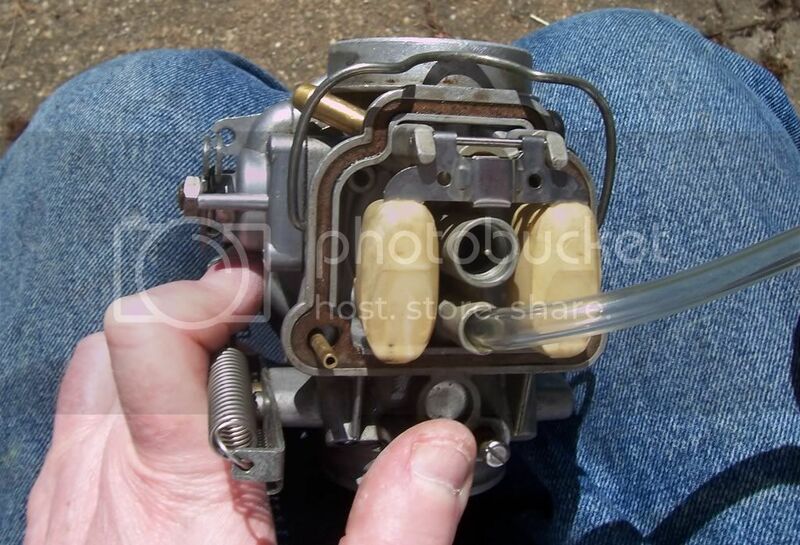 Remove the needle jet and its holder from the carb body by gently pushing it out with a finger. Next have a good look into the emulsion chamber. If you need to clean it inside, lift the slide by hand to keep the needle out of the way and use carb cleaner on a rag. A wooden skewer can also be useful. Next remove the pilot jet using the flat screwdriver, being careful not to damage the slot. Check the o ring for splits and being perished then blow it through with carb cleaner. I do this by screwing it into the 6 inch pipe. However you will need to hold the jet very tightly when doing this as the force on it is quite high. If you dont hold it it will shoot out for at least 10 feet! I then dry all the holes in the jet using canned air and check that they are clear. Next carefully screw in the mixture screw counting the number of quarter turns it takes to reach the end of its travel. Remember this, or better yet write it down, and then unscrew and remove the mixture screw. Again check the o ring, and look at the tip of the screw for fouling. Using the 6 inch pipe, blow carb cleaner into the mixture screw hole. The smallest airways are those the feed the two tiny holes that are in the venturi under the throttle plate when it is at rest. These effect the pick-up from idle. 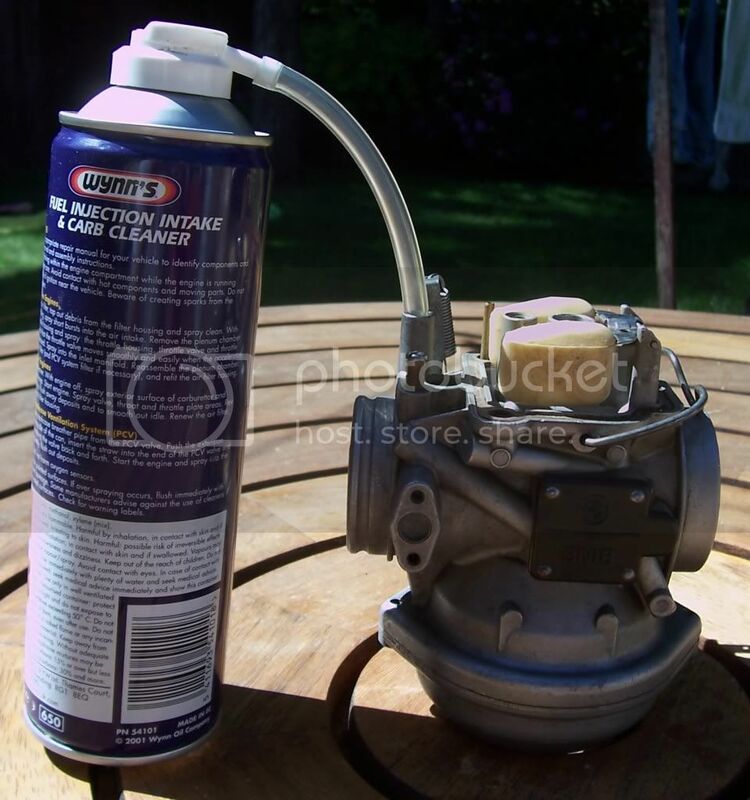 To clear these blow carb cleaner into the idle jet holder whilst holding the throttle open. You should see jets of cleaner streaming out from both holes. 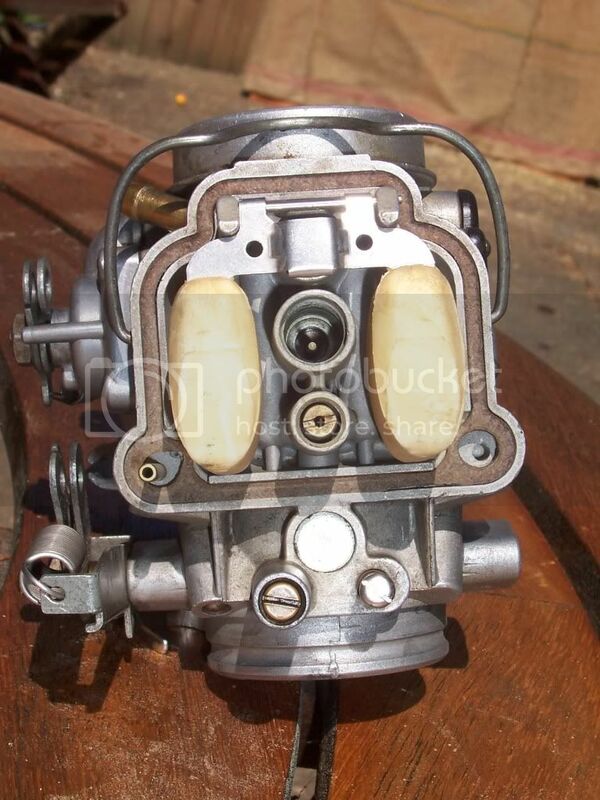 Now the carb is all clean simply re-assemble. Start by replacing the main jet assembly. Drop the needle jet and its holder into the main jet tube, over the needle and wiggle until the needle jet holder drops though so that a little shows in the venturi. Then gently screw in the main jet holder by hand, finishing off gently with the spanner. They go in in this order. Replace the mixture screw, not forgetting the spring, and adjust it to the number of quarter turns you found when taking it out. Replace the idle jet. Note that I did not disturb the floats or the float valve. I only remove these if the carb is leaking fuel. 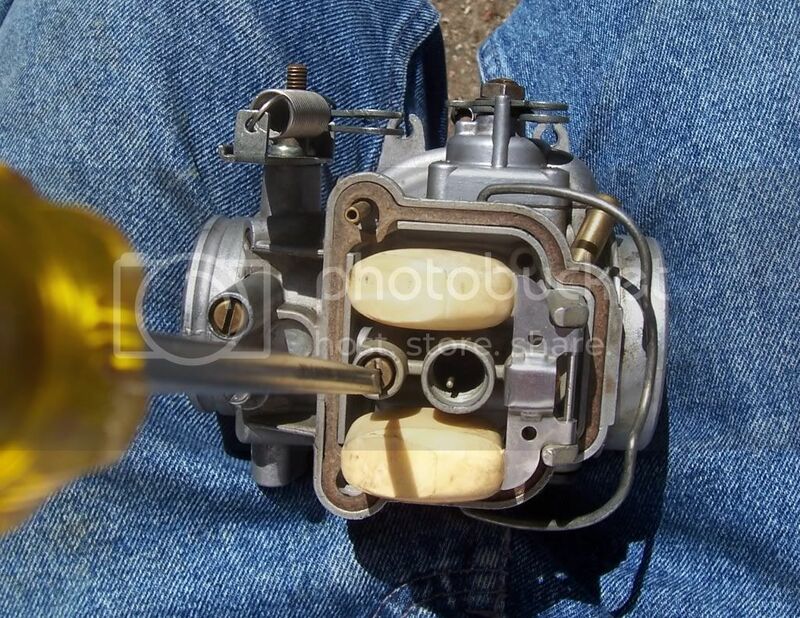 Replace the carb on the bike and then clean the other one. Once you have done both check the free play in the throttle and choke cables. You are then good to go (although a tune would be a good idea). Thank you very much for that, very instructive, you obviously went to a lot of trouble. One thing I found out (from UKGSer, actually) was that the little safety-pin spring clip on the float valve should be clipped to the float so that the weight of the float pulls the valve open during long periods of disuse during which the fuel in the bowl evaporates. If it wasn't for this clip then the needle valve tends to stick in the closed position thus causing problems on eventual start-up. Interesting to see that the washer under the main jet, by the jaws of the spanner, see your photo no. 4 isn't a particularly large, all the ones in my Bings have been bigger for some reason, actually, if I remember correctly they are like that (i.e. big) in Haynes as well. Perhaps they are meant to act like a baffle? 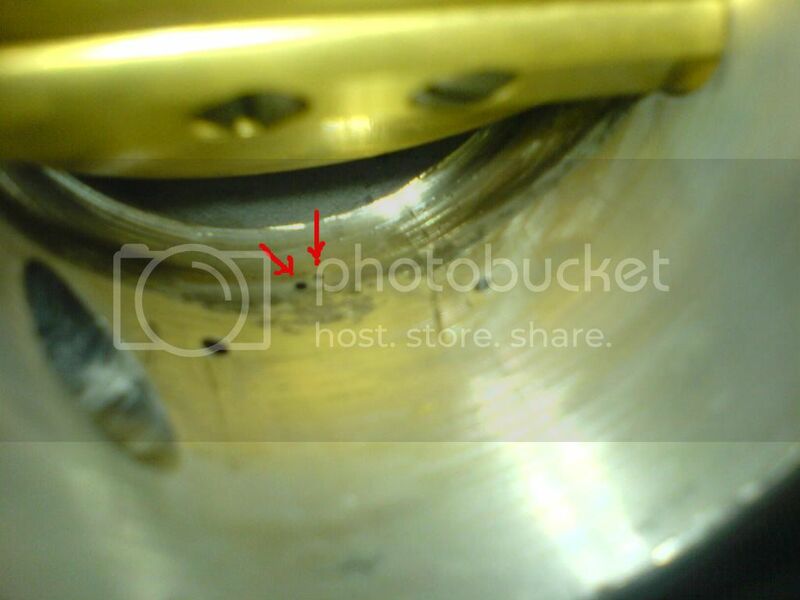 Also, photo #5, the cork cover gasket around the tube to the jet in the bottom of the bowl you mention in the caption to photo #3 seems distorted rather and it looks doubtful that it's sealing as well as it could from the indentation made on the cork, in fact I've noticed that on my own carbs. Could that make a difference to anything, I wonder? Mine seem to run OK just the same. Do you use something like CopperSlip on reassembly? No, you don't want to introduce anything that might block the jets. I would also recommend using a screwdriver that fit's better in the slots than the one shown. Remember - brass is a very soft metal and it's easy to chew up the jets if you're not careful. I second the advice about keeping a firm hold of the jets when blowing them out. You'll be surprised how far they can fly and how well they can hide. Health & Safety tip: wear goggles/safety glasses when using compressed air or aerosols. Carb cleaner can sting a bit if it gets in your eyes. John, you are absolutely correct about the little clips on the float valve. The washer shown in the picture was supplied by Motorworks as a genuine part a few years ago, the one it replaced was a lot bigger. As it is immersed in fuel I dont think the width is important, only the thickness. 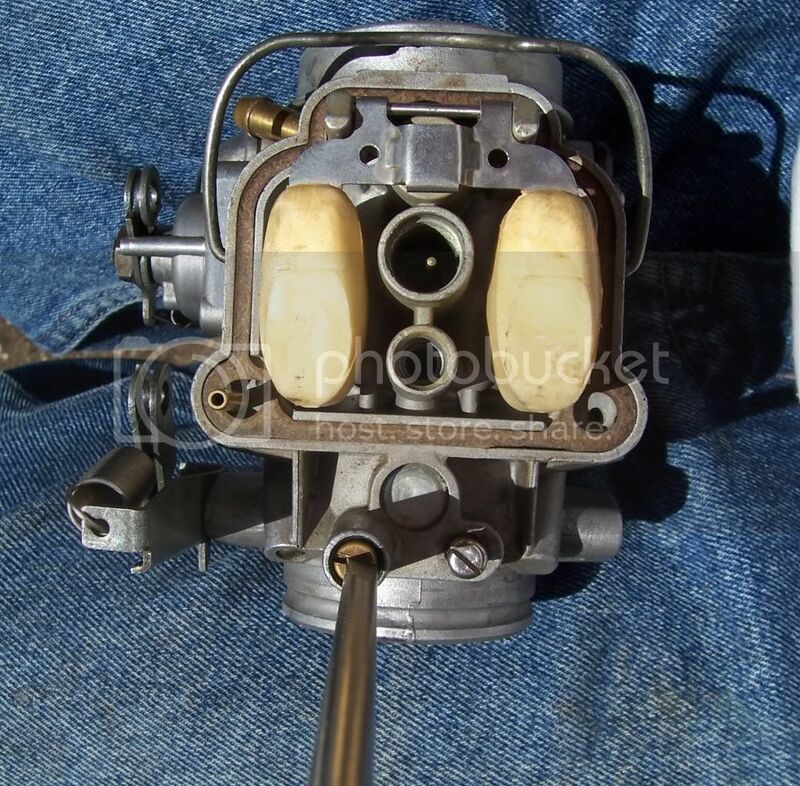 I have noticed several Bing carb parts change in shape in non-essential areas over the years. All the cork washers distort like this after they have been in place for a while, but unless they distort a lot the seal remains OK. If the seal isn't OK it will only effect the enrichener, which will be a little weaker. 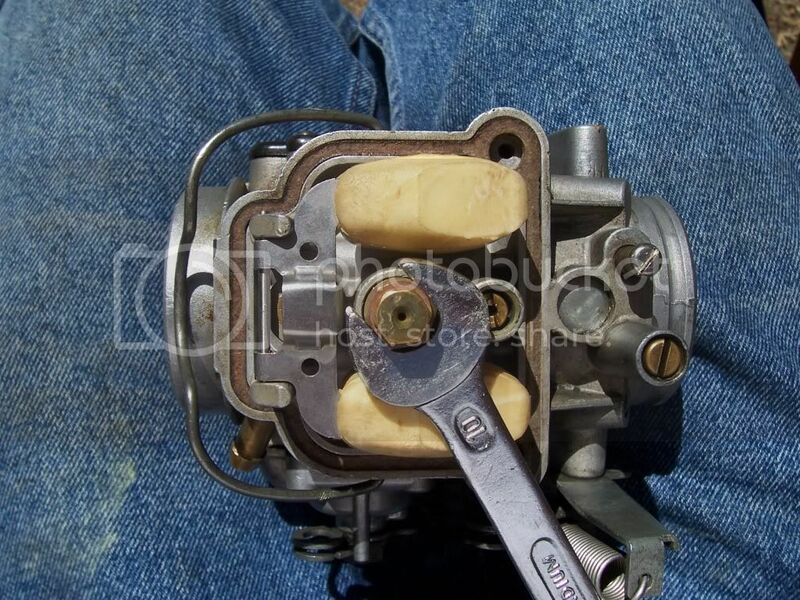 I have seen people recommend a little copperslip or vaseline on carb parts but I agree with brassmonkey, I dont want to risk anything blocking the jets. As he says the screwdriver must be a good fit in the slot. Mine is better than it looks in the photos. Dont forget I was holding a camera at the same time! 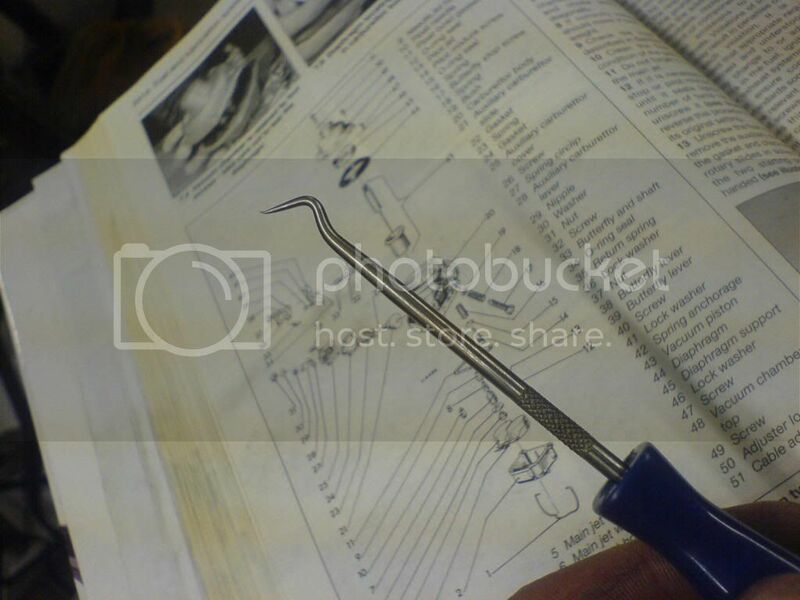 The screwdriver in the original tool kit is ideal. I would like to reiterate this point. Excellent stuff.Thanks for that. I have recently purchased a R80GS & was just looking for how to clean up the carbs. Thanks very much indeed.....just what I needed. Remember, we are only here for a good time, not a long time ! I took a load of pics while doing mine this weekend to add to this thread but half of them didn't come out and I ain't stripping them down again. Anyway, if you're about to strip your carbs it would be a good idea to have the carb overhaul kits to hand so you can replace any gaskets, diaphragms or O rings as needed. 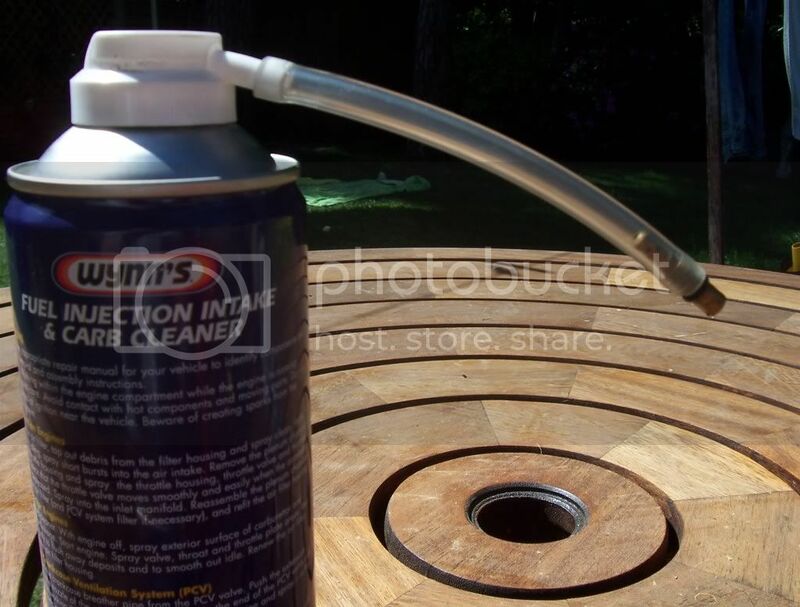 Also useful to have is an air duster - a can of compressed air available from Maplins or Staples amongst others. But don't under any circumstances use a pick to poke in any holes or jets. 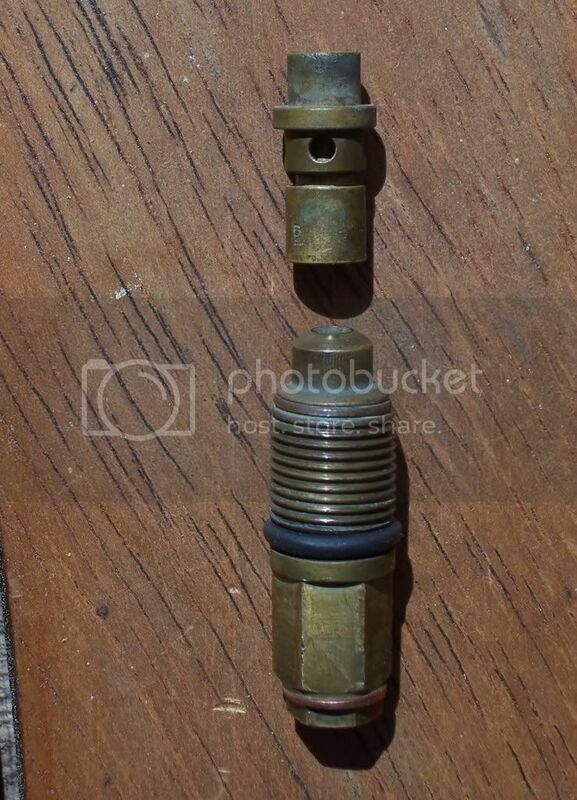 You should have a selection of flat screwdrivers for all the different jets, and also size 2 & 3 Phillips screwdrivers to take the choke covers and the carb top off plus an 8mm spanner for the main jet. The two tiny holes just about visible in this pic. 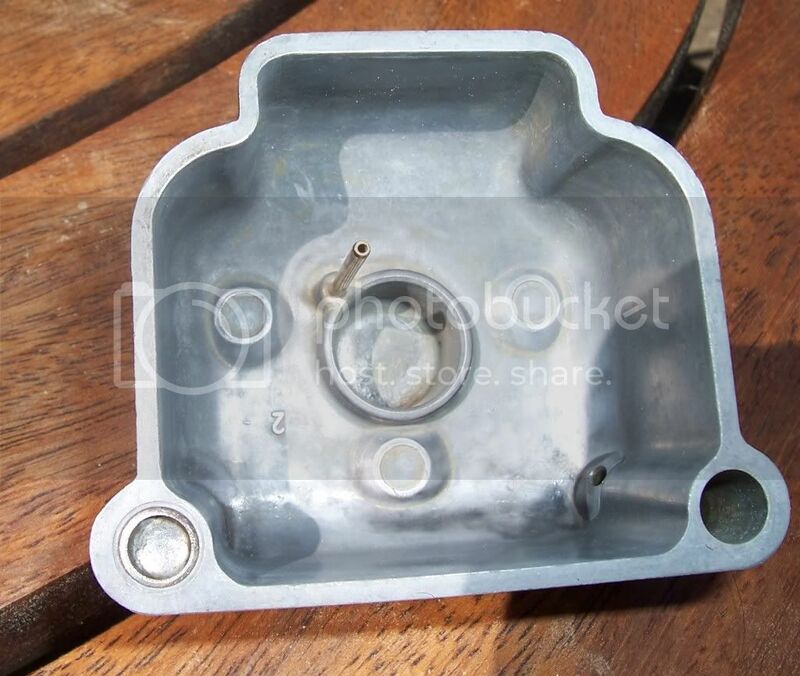 I think Proff may have mentioned using an ultrasonic cleaner for carby parts. Has anyone had any further experience with them. Seems like a good idea for delicate parts like jets etc. I had a look on Ebay and am not sure where to start but am guessing something with 2.5 litres capacity? I don't think I would put my crown jewels in an ultrasonic cleaner. Its the best way to clean them. Inside and out gets done. Strip it and chuck all the parts in. Fit new jets/needles/gaskets. The capacity is not too relevant. I have a small, as in about a litre capacity, with a heater element. Works well with a detergent or special additives. Done alsorts with it, great bit of kit.